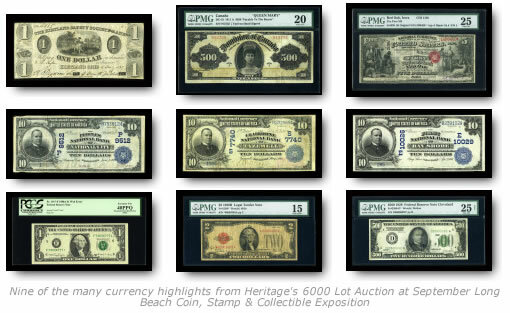 Dallas, TX: Heritage Auction Galleries, the official auctioneer of the Long Beach Coin, Stamp & Collectible Expo, will conduct a 6,000+ lot Currency Signature® Auction on Wednesday, Thursday, and Friday, September 17-19, 2008 at the Long Beach Convention Center, 100 South Pine Ave., Long Beach, California. The Convention Center is also the site of the Long Beach Coin, Stamp & Collectible Show, as well as the location for lot viewing for all Heritage auctions. Nearly 2,000 of the lots will be included as part of the online session. “Wednesday evening’s session will open with more than 300 Colonials anchored by the Collection of a Louisiana Gentleman,” Johnston said, “and will then continue on move to a selection of more than 400 Obsoletes, including a complete denomination set of PMG graded Kirtland Safety Society Mormon Notes, and many high grade Proofs. Johnston continued, “Session Two, which kicks off early Thursday evening, will feature over 800 National Banks Notes, including some of the most exciting discovery notes of the year. The Fr. 399 1865 $5 Original Ch. 2130 First NB Red Oak, IA Serial Number One with Black Charter Numbers, a Fr. 618 1902 $10 Date Back Ch. (P) 9512 The Peoples NB National City, CA Serial Number One, and a Fr. 616 1902 $10 Date Back Ch. (S) 7740 Claiborne NB of Tazewell, TN, will all be offered to collectors for the first time. “Friday afternoon offers a diverse offering of Small Size Notes and one of the most impressive offerings of Error notes in years,” said Johnston. “A number of rarities last seen in the 1946 Grinnell Auction are once again being offered to collectors, including a Bay Shore, NY $10 1902 Date Back with mismatched Charter Numbers. “The Dr. Edward and Joanne Dauer Collection of Demand Notes opens the Friday night Large Size session,” Johnston said, “and includes two unique notes, a Fr. 9a 1861 $10 Demand Note graded PMG Very Fine 30 and a Fr. 11a 1861 $20 Demand Note graded PMG Choice Fine 15 Net. Next, the Jupiter Collection will be sold and includes an impressive selection of Large Size and Small Size rarities, including the Fr. 1219b $1000 Gold Certificate PMG Very Fine 25 and the Fr. 1192a $50 Gold Certificate PMG Very Fine 25. Both notes are unique. Among the Jupiter Collection Small Size rarities is a Fr. 2407 1928 $500 Gold Certificate PMG Gem Uncirculated 66 EPQ, two $5000’s and two $10000’s. Each of the notes in this collection was selected because it is Gem in quality, one of the finest available for the type, or exceedingly rare. All of the lots are illustrated in color on the Heritage web site, which may be found at www.HA.com/Currency. If you are interested in selling your collection in this greatly anticipated auction, contact one of our Currency Specialists at 1-800-872-6467, Ext. 1001. Heritage Auction Galleries is the world’s third largest auction house, and by far the largest auctioneer of rare collectibles, with annual sales over $600 million, and 375,000+ registered online bidder members. For more information about Heritage’s auctions, and to join and gain access to a complete record of prices realized, along with full-color, enlargeable photos of each lot, please visit www.HA.com.